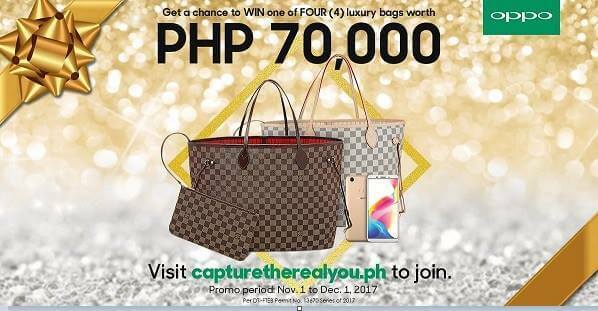 OPPO Philippines recently announced its Capture the Real You contest, where four luxury bags worth Php70,000 will be given away this November until December 1, 2017. Open to all consumers who will buy an OPPO F5 within the promo period, participants must visit www.capturetherealyou.ph to register their full name, email address, registered address, and the unit’s IME1 number. The F5 has successfully got a record-breaking 33,000 total pre-order units in just one week. With this, the company expressed their gratitude by running the said promo. “OPPO highly appreciates the overwhelming support that we received from the F5 pre-orders. We have always been grateful for our fans’ continuous support and this is just one way for us to give back to them,” OPPO Philippines Brand Marketing Manager Stephen Cheng noted. To join the contest, participants must upload three photos captured using the F5. These photos must include one natural-looking selfie, one beautified selfie, and one taken using its rear camera. Entries will be accepted until December 1, 2017 at 2 P.M.
With one lucky winner every week, the raffle draw dates will be on November 10, November 17, November 24, and December 1, Meanwhile, the announcement of winners will be on November 11, November 18, and December 2 through OPPO Philippines’ official Facebook page. Also, an email notification will be sent to the winners. The OPPO F5 is now available nationwide for Php15,990.